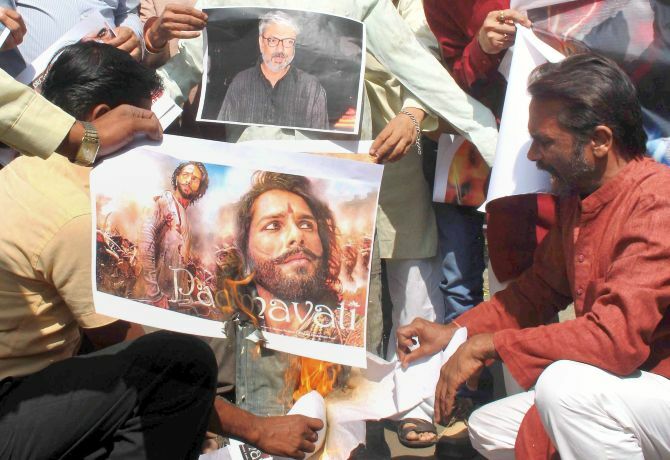 In letters to Union Minister Smriti Irani and ‘Padmavati’ director Sanjay Leela Bhansali, Haryana minister Vipul Goel sought changes in the Bollywood film and said that “glamourising Alauddin Khilji’s character was akin to praising those who carry out acid attacks on girls”. In a letter to the Union information and broadcasting minister, Goel drew Irani’s attention to the controversy surrounding the film, due to release shortly. He said that apart from the Rajput community, there were concerns regarding the movie in other sections of the people as well. The magnum opus starring Deepika Padukone as Padmavati, Shahid Kapoor as Maharawal Ratan Singh and Ranveer Singh as Sultan Alauddin Khilji, is based on the legend of Rani Padmavati, a Hindu Rajput queen. The minister claimed that these concerns pertain to “whether historical facts in the film have been presented in a twisted manner”. “There is anger among the people of Haryana, like many other states, regarding the film glorifying the negative character of Alauddin Khilji rather than our own rich history,” the Haryana industries and commerce minister said in his letter to Irani. He also mentioned that films based on historical facts, while exercising the freedom of thought, should also keep in mind the people’s sentiments and culture. “Therefore, I request you that the film be cleared only after keeping in view the public sentiments and historical facts, and ensuring that historical facts are not twisted in the movie,” he appealed to the Union minister. In a separate letter to Bhansali, Goel, claimed that he had seen the movie’s trailer and that Khilji’s “negative” character had been glorified in the film. “To glamourise Khilji’s character is akin to praising all those people who carry out acid attacks on girls. To glorify Khilji’s character may give you success at the box office, but in such circumstances this film will fail to do justice to our country’s rich history,” he said. “I want to ask you, is glorification of Khilji’s character for the sake of public entertainment justified?” Goel said. He said that voices are being raised against the film in many parts of the country, including Haryana. “I being an elected representative, request you that the film be released only after making necessary amendments and keeping in view the public sentiments. And if this is not possible, then you must answer the concerns about the film that are being raised so that your film is screened in a peaceful manner,” the minister said. On Saturday, Haryana’s Health Minister Anil Vij had said the state government will approach the Censor Board to seek a ban on the upcoming Bollywood movie ‘Padmavati’. Vij had said he would not allow the screening of the movie in the state. He had alleged that the historical facts in the movie had been wrongly presented to “defame” the image of Rani Padmavati and that it had hurt the sentiments of lakhs of people. “Rani Padmavati is the symbol of Indian womens’ pride. The character assassination of Padmavati will not be tolerated at any level,” Vij had said. Ranveer, Deepika, Shahid: Whose look is the best? VOTE! Are you free to express your thoughts in your country?